DAYTONA BEACH, Fla. — It’s the question all Dodge stock-car fans want to know: When will the manufacturer return to NASCAR? Not in 2014, that’s for sure. While Dodge continues to discuss stock-car racing, according to Ralph Gilles, president and CEO of SRT Brand and Motorsports, Chrysler Group LLC, "the timing isn’t right." But Gilles is well aware that stock-car enthusiasts miss the Dodge brand in NASCAR’s garages so never say never. "We haven’t forgotten about NASCAR," Gilles told FOX Sports on Friday. "We have a lot of pressure on our capital right now. The Dodge brand has a new chief (Timothy Kuniskis, president and CEO of Dodge Brand), right? He’s an enthusiast. He owns a Charger himself, it’s his daily drive. He has an older one and a new one. He gets it. He understands. "But timing is everything. To get back in the sport is not an insignificant investment. It’s something that we’ve said no to. This year is out of the question, but the future, anything could happen. The fans want us back, so we’ll see." Although Gilles insists Dodge has "the people that can do" the program, what is lacking is a strong alliance with a team, particularly an organization that can win right out of the gate. 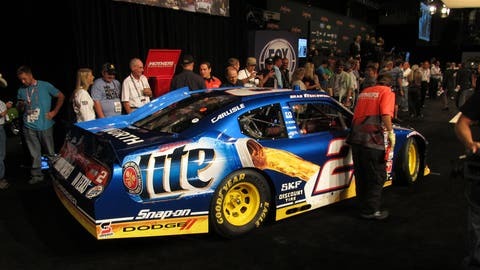 Certainly that was the case during the manufacturer’s last season, with Penske Racing in 2012, when Brad Keselowski won the Sprint Cup championship. However, it likely would take a sizeable investment from Chrysler to attract an existing organization to jump ship. "We’re never going to have the wherewithal to scoop everybody up," Gilles said. "We’re not big enough to have a stronghold, so it’s always been an issue of having the right team. When we were [with] Penske and before that Evernham (Motorsports), the moons were aligned back then. "Things made sense — the right people in the right places. Today, it’s not quite the same." Gilles understands that competing in NASCAR is "a marketing expense at the end of the day." It is the main reason SRT elected to campaign its Viper brand in IMSA, where the demographics of the audience marries up to his customer base. Gilles arrived at Daytona International Speedway on Friday to support SRT’s three entries in IMSA’s GTLM (Grand Touring Le Mans) class, formerly part of the American Le Mans Series. While Gilles — a gentleman racer himself — will wait to compete in the Rolex 24 at Daytona until after he retires, he believes the merger of the two sport-car tours into what is now IMSA "is great." "It’s something that we’ve been talking about around the water cooler for years because they’re two great series and there’s a lot of overlap," Gilles said. "I think they started in competition, but they realized they have a lot more in common. "As an OEM [original-equipment manufacturer], it’s a dream come true. And (International Speedway Corporation) has created a phenomenal support network for motorsports in the U.S. They own half of the best tracks in the U.S., so it just makes sense. It really does."